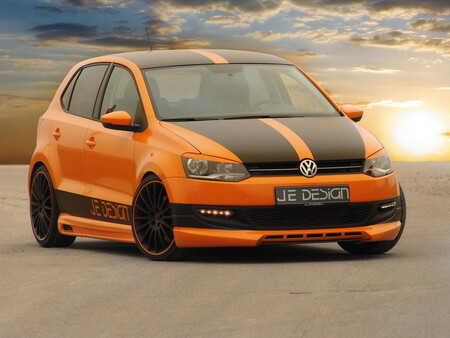 Volkswagen specialist JE Design has prepared a new package for the lovely little Polo which like all of their other kits is so ostentatious! The car gets a full body kit consisting of front spoiler, side skirts, rear skirt with a diffuser and twin central exhausts. It also gets a new grille and a two-ton paint job. JED’s Polo LED daytime running light which have two function: when the dipped head lights are on, the LEDs are dimmed into parking light mode. When the dipped head light mode is off, the LEDs sparkle brighter in the daytime light mode and therefore improve the traffic safety. The tuner fits the Polo with a modified suspension system which is lower by a good 35 mm than the standard, but you may also order the more expensive KW coilover suspension made of stainless steel which can lower the car up to 65 mm. The package also includes 17 or 18-inch multi-spoke black wheels and leather interior. JE Design is also working on performance upgrade for all of the engines in the range.